PITTSBURGH (AP) - This ought to be good. It's common for playoff opponents to talk about not liking each other, but the Philadelphia Flyers and Pittsburgh Penguins truly don't. They haven't since the moment they entered the NHL together as expansion teams in 1967, and they almost certainly never will. How could they? This oft-bloody, always contentious series not only spawned the longest game of the NHL's modern era (the Flyers' five-OT playoff win in 2000) but may have shortened the careers of Eric Lindros and Mario Lemieux. More recently, it caused Sidney Crosby to lose a couple of teeth but gain a wealth of respect as an 18-year-old during his very first game in Philadelphia. "You learn quickly how big the rivalry is," Penguins forward Chris Kunitz said Tuesday. Now, they're going at each other in the playoffs for the second season in a row, a first in the ever-so-nasty rivalry's 42-year history. If there's anything the two teams agree on, it's that this series won't be anything like the Penguins' five-game romp over the injury-thinned Flyers in last season's Eastern Conference finals. "The rivalry here is well known," Flyers coach John Stevens said. "The teams don't like each other very much. Any time you play a team two years a row in the playoffs, the emotions roll over." They're rolling right into what might be the best of the NHL's quarterfinals, a first-round series that begins Wednesday night in Pittsburgh but may feel like a 15-rounder before it's decided. Or much like it did to a weary Lemieux in 1997, when he retired for the first time following a playoff series loss to Philadelphia. "You have some rivalries, some players you dislike, and I'm sure it's the same over there," Flyers captain Mike Richards said. The Flyers can kick only themselves for opening on the road; their Sunday loss to the Rangers resulted in Pittsburgh being seeded fourth and the Flyers fifth in the Eastern Conference. The Flyers were 11-10-2 down the stretch, compared to the Penguins' 18-3-4. "Whatever you did in the season, it's all over. You start at zero again," the Flyers' Simon Gagne said. "Sure it's nice to have all those points and goals in the season but the real game is starting. A lot of players make their reputation when they play in the playoffs." 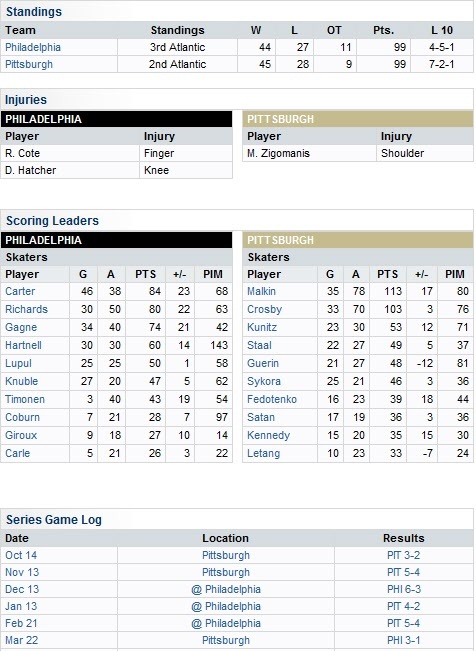 A year ago, injuries sidelined Gagne and defensemen Kimmo Timonen and Braydon Coburn against the Penguins, who outscored Philadelphia 20-9 in the conference finals and 6-0 in the decisive Game 5. All three are ready to go now. There's also this obstacle for the Penguins: Since that 1967 expansion, only the Edmonton Oilers in 1984 won the Stanley Cup a season after losing in the finals. Blame the fatigue of one extended season carrying over into another, but most losing finalists never get close to going back a year later. With two of the NHL's top three scorers in Evgeni Malkin and Crosby, plus plenty of momentum from their late-season surge, the Penguins believe they're positioned to make another extended run. "I think it's harder due to the quality of teams, the quality of players in the league, than maybe it was previously," Penguins coach Dan Bylsma said. "I don't think it has a lot to do with being tired or having a short offseason." The Penguins, who were in danger of missing the playoffs until they got hot after Bylsma replaced Michel Therrien in mid-February, want only "to keep playing like we've been playing," according to defenseman Sergei Gonchar. That means constantly pressuring the puck, rolling three productive lines led by Malkin, Crosby and Jordan Staal and getting more strong play from goaltender Marc-Andre Fleury, who is 16-3-3 since Feb. 19. Crosby has 20 goals and 26 assists in 26 games against Philadelphia, and Malkin has 13 goals and 18 assists in 21 games. "A mental edge, we're going to try to get it in certain ways, and hopefully we get that with how we play and how we need to play - grind them down on the ice," Bylsma said. "That will speak for itself and that will be the goal for the team." To counter Pittsburgh's considerable skill, the Flyers must find scoring throughout a lineup that has six players with 25 or more goals, led by Jeff Carter with 46. They also must be at their agitating, feisty best to keep the Malkin and Crosby lines off balance; Timonen and two-way center Richards are keys to that. So is goalie Martin Biron, who was 29-19-5 this season. "Mike (Richards) can't play against both of them, can't play 40 minutes, so we're going to have to do it by committee," Stevens said. "Crosby is a competitive guy. He competes at a very high level." The Flyers learned that in Crosby's rookie season in 2005, when defenseman Derian Hatcher repeatedly bloodied the youngster with his stick only to have Crosby return after getting stitched up to score the game-winner in overtime. :fight: Lets get it on. 504Heater wrote: :fight: Lets get it on. figured that emoticon would be more suited for Alex Semin lol, he's more of a girly fighter lol, do we having a whining emoticon, it could serve double duty, Sid the Kid and Kovalev lol. 1-0 Pitts on Crosby's goal! This is rough!!!! Not only do we have to put up with the fact that the Sens aren't in the playoffs... But we have to put up with Dean and Gary in the playoffs... Oh the humanity!!! Oh these guys just LOVE each other. shabbs wrote: Pens up 2-0. Yeah, I'm switching back and forth between this one and the Caps one and the Caps' game is more exciting. That said, Sidney Crosby is incredibly fun to watch when he's not mouthing off to the officials. He doesn't have OVs shot, but he's just as capable of beating defenders with high-light reel moves. Malkin's not bad either, though he plays the game a little slower and isn't quite as exciting (but recall that I think Malkin is the best of the three). Also, Jordan Staal is an absolute beast. Even if he doesn't have high offensive potential, he's having a huge impact on this game. Tyler Kennedy looks good (in style of play only) as well. OV is awful defensively. Just awful. He hangs around at centre-ice waiting for a pass. Also, he led the league in give-aways. Malkin, on the other hand, led the league in take-aways. People hate on Crosby I think because the league needed someone to market and he seemed the natural fit. He's been forced down our throats. His whining is irritating as well. That said, he is an absolutely incredible hockey player, and a joy to watch.